Would you like to participate in a Living Values Education Self-development Research Study designed to assist Living Values Educators develop a better understanding of the impact of Values when deeply contemplated in our own lives? In 2017, Living Values Education is reaching out to everyone in the world with a new Vision: Extending our current activities through a "Distance Learning Program" for individuals, study groups and those desiring to be facilitators. This composite program includes our existing activity modules drawn from the LVE Activities workbooks PLUS the new focus of "Living in My Values" through a simple 12 week self-development, self-discovery program. Why Are We Asking You to Join Us? Truthfully, before we go to the general public, we want to be sure that we are not inviting others to do something we have not done ourselves and so you, who represent the international core teams of Living Values Educators are invited to join with us, Board members, Associates and Focal Points, Trainers and Facilitators by personally experiencing the concept of "Living In My Values" for this 12 week Study. Benefits of Participation: You can discover more deeply about yourself and, according to Gandhi, as your awareness deepens, your life could well be expected to change as a result. Participation: It requires little of you, just honest contemplation and personal assessment of one of Humanity’s 12 core Values – ten minutes each morning and evening for one week, living in the dynamic of that Value for a week and during the week, evaluating your feelings and realisations relative to the Value and any changes that you discover occurring in your life. Frequency: Each week on Sunday on the website you find your next Value and the accompanying self-development questions. We encourage you to check out the program and how it works on lveresearch.net. You can register online and immediately on login begin participation by engaging the Value of the Week. Living Values Australia annually holds four 2- and ½-weekend group workshops for people interested in becoming Facilitators. Each workshop embraces three or four specific Values and explores a particular theme – Human Rights, Refugees, Relationships, etc., areas where Values play a dominate role. After attending two weekends, participants are offered the opportunity to continue to become facilitators, co-facilitating nominated activity modules 'honing' their skills at leading the group through the LVE experience. This month seven participants gathered at the home of the local Focal Points for LVE in Australia, Suzanne Stallard and Raj Miles, in Wondai, Queensland to finalize their training. Ms. Taka Gani, a lead LVE trainer from Indonesia, joined the group to undertake the completion two day TTT process. The certificate given endorsed the new facilitators to organize and deliver LVE workshops. In the past, Australia’s Living Values Education growth has been constrained by attendance time requirements and long distance travel cost which has prevented bringing people together for multiple LVE workshops. A new initiative has been recently trialed to combat these difficulties: the 12 week Distance Facilitator Training (DFT) Program comprises a Home Study program based on activities drawn from "Living Values Activities for Children 8-14", "Living Values Activities for Young Adults" and a Facilitator training manual from "LVEP Educator Training Guide" and other international training organizations, and attendance at one practical facilitation five-day workshop which incorporates the basic TTT elements. The Living Values Activity Facilitator certification completes the Program. In addition to working through the Living Values Education activities relative to each Value, the real personal development comes from the experience of 'living–in' each Value for one week. Participants who have been trialing the Program are discovering the requirement to embrace the Value daily helps them see their behavior and negative responses to circumstances in the moment and to correct themselves. The three-month commitment is not necessarily easy as the Values bring up a lot of deeply emotional patterns. As one person wrote, "I hate not being able to control something and in writing this I realise I can't control myself, this incessant want for food to fill me up to make me feel better, to stop feeling this uneasiness that is still rising in me. I can't continue in this way; something is bubbling and going to burst, not sure if it will be my heart. The growing sensation seems so loud I will burst through all the resistance I have been feeling to completely change my life. I want to break through the crap." Participants in DFT are required to document their weekly ‘lived-in’ Values experience and submit together with their Journal notes on their chosen Living Values Education Activities. A second initiative in response to several requests from people around the country, untrained in Living Values Education but who want to explore Living Values in a casual shared community environment, the Focal Points developed a 12 week Study Group program. This Program provides all the guidelines for the successful running of a Study Group, the delivering of the Values activities and sharing of the group’s ‘living-in’ values aspect. No formal reporting is required. A newsletter is envisaged to bring groups together to share experiences. The third initiative is a combination of the first and second Programs whereby the Study Group package is offered to people with common interests, e.g., working in social welfare organizations, with the full reporting requirements of the DFT. The Focal Point for LVE provides the group with their practical workshop experience and certification at the Study Group location anywhere in Australia. Last November we held an introductory one day seminar at company in Canberra which resulted in a recommendation by their staff that management adopt LIVING VALUES as their Culture at every level throughout the Company. In Australia, the opportunity to bring Living Values Education to schools has been stifled due to bureaucratic and administrative difficulties. This has encouraged LVE Australia to take values awareness into the community. Last year we introduced Living Values Education as a 'change in culture' – re-framing how management and a team see themselves and relate to one another and to the clients or customers they serve. The Living Values program requires courage to implement. It requires progressive thinking to embrace a complete turn around for organisations that have been founded and focused on volume, profitability and performance based ideology. Not withstanding this, a company based in Newcastle and Canberra, New South Wales, which has established a business caring for teenagers and young adults in 24-hour supervised housing, decided to embrace the possibility. They recognised that to move to the next level of excellence they needed to change the approach to their ethics and all relationships. They chose to embrace the Living Values Culture program at every level of the organisation, extending, most importantly to their young people, their 'clients'. Meeting others’ needs...how can we serve you best? A proposal was put to the organisation following an audit undertaken with 18 staff interviewed in the two cities, focusing on how they might create change by implementing Living Values. We offered a three stage program that would empower management and staff alike to embrace Living Values developing pro-active initiatives in caring for young people and improving day-to-day operational matters in a cohesive and effective manner, through respectfulness, integrity, personal responsibility and tolerance. Following the audit, we held a customised LVE weekend workshop in which management, administrative and care givers participated. The Values activities were designed to meet both personal and company challenges and goals and showed how effective it is to have common communication at all levels generating improved working relationships and increased self-responsibility. In the process, the group united to support the Living Values Education culture environment. A Culture Change Team of four members drawn from all three levels of the organisation was established to supervise all 100 staff in the introduction to the Values. The Living Values Home Study program with activities based on the core 12 values provides a new 'corporate' value every two weeks. This value then becomes the theme for the working environment. Values signs appear at all work stations, as signatures in emails and in-house correspondence. All staff including management is required to submit at least one completed activity from the Home Study program answering questions relative to the value of that period. The Change Team monitors results and keeps everyone on track. The owner of the company and the administrative assistant both participated in a LVAYO (Living Values Activities for Young Offenders) workshop to gain an in-depth understanding of working with young people the Living Values Education way. Our goal is to provide the organization with the support they need to become a Living Values “Model Site” in the next six months. Living our values, sharing respect and positive regard for one another in our working environment is more than just getting performance, it becomes a way of life. Without these qualities, we have little chance of helping people and growing our world from hopelessness and isolation to peace, belonging and respectfulness. The Culture Change program has the potential to address all of this. One final note: We are all short of funds for our Living Values programs. The Culture Change program will greatly increase employee work ethic, improve customer relations and naturally impact positively on profitability. Companies expect to pay for this service so if you are seeking to gain income to support your other LVE activities consider this program. Other Living Values Associates and Focal Points are invited to review the Culture Change program in depth online at www.livingvalues.com.au. “Hailing from throughout Australia and Bali, a committed group of educators, trainers and directors from an organisation that works with young offenders, gathered at a beautiful venue on the Gold Coast. Roger (Raj) Miles and Suzanne Stallard, the Focal Points for LVE for Australia certainly knew how to pick the right spot and the right group of people to participate in the training,” wrote Trish Summerfield, the LVE Lead Trainer for the workshop. From the first day, the strength of the program was apparent and the participants gained clarity and personal understanding as they worked through key lessons in the Living Values Activities for Young Offenders (LVAYO) book. The power of the lessons in supporting a positive healing process and the building of self esteem for not just for young offenders but also for adults in general was obvious to the participants. The training also focused significantly on the importance of highly effective facilitation and listening skills to support youth as they go through the lessons. The trainers’ main challenge during the training was that the LVAYO book contains so many wonderful lessons it was not easy to select which ones should be used in the training! 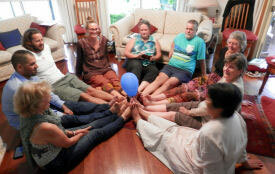 On day six the participants created plans for applying the program in both Australia and Bali. Raj and Suzanne report: “As the Focal Point for Australia we can say that the workshop was a success from every point of view. We learned so much from witnessing the facilitation skills of a Lead Trainer and so much more about the opportunities that Living Values has as a potential for change in the world. While a six day workshop is a challenge for attendance to have the depth of the sessions, opportunity to engage in role playing, group breakouts and really engage the material we do not see how it would be possible to do the workshop in less time and have the same full benefit as we experienced. We would encourage all ALIVE Associates and focal points to consider this workshop, perhaps on a regional basis, for the rejuvenation of facilitators. There are so many applications where LVAYO could be applied and we would encourage a review of the name to widen the possibilities for it allows us to address 'real life' challenges not just for Young Offenders but all areas where people are in crisis both young and old. This program takes Living Values Education to a completely new level where it truly becomes a dynamic tool for human development. – Melbourne and Geelong, both in State of Victoria. A total of 18 participants attended with several following through for facilitator training.We held our first ‘LVE Business’ one day workshop for Living Now magazine with ten employees and management with a very successful outcome. – With 13 participants at the workshop and 4 new facilitators attending the May TTT this made for a great five day affair – more like a Retreat with many of the workshop participants staying over the extra days in support of the new facilitators. The new facilitators, Paula Bendel started Brisbane activities, Laura Re, Joanna Youssef started Melbourne and Nic Dacomb opened up LVEP in Byron Bay. - Living Values Education will be represented this year at the Brisbane Mind Body Spirit Festival by Nic Dacomb. – With 12 participants at the workshop and 4 new facilitators becoming accredited at the TTT by Carol Seymour will take LVEP into three more community groups. Brisbane, Qld – Exploring Values – community weekly evenings. Toowoomba, Qld - Exploring Values – community weekly evenings. 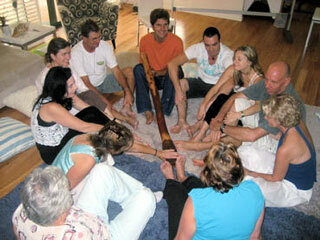 Byron Bay, NSW - Exploring Values – community weekly evenings. Weekend workshops for teens. Melbourne, VIC - monthly with free intro evenings, regular facilitator workshops commencing June. 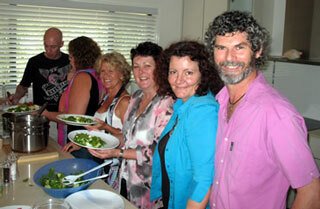 Annual Living Values Education Retreat – Byron Bay 19 – 29 November includes workshop and TTT and AGM. Individuals wishing to offer LVEP in their own communities throughout Australia may now request LVE accredited facilitator(s) to undertake the workshop for them locally. Carol Seymour, who has applied to be the Focal Point for New Zealand manages the Australian TTT process and this led relationship has led to the realization that both Australia and New Zealand have very similar cultural and community needs and opportunities for LVEP. The twelve week Home Study Living Values Education Course, using modules and activities from the Education series books is designed for use by the individual at home. In addition the Course has also been adopted by facilitators as a Community weekly evening seminar series and now available in both countries. The October Gold Coast Living Values Education workshop included the TTT process and certification for two couples – four new facilitators who will be working together in SE Queensland. Deb Drechsler and Eoin Bell from the Sunshine Coast are interested in assisting young adults, particularly those at risk in areas north of Brisbane. David Webby and Vicky Boyle will be focusing on Relationships. Both couples are planning workshops for early 2010. 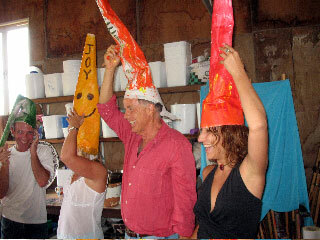 David and Vicky are hosting their first 'RELATIONSHIP' Living Values workshop on weekend of 27 – 29 January 2010. In early November the first Parent and Child 'playday' was held on the Gold Coast – this trial was to establish the benefit of a sharing day with Mums or Dads and children exploring Values in the family. Using the 'Coat of Arms' activity the families were encouraged to explore what each family stood for and identify their values. This was lots of fun and a great together time. Adelaide, South Australia, Thursday 28 January to Monday, 1 February. Alice Springs, Northern Territory. 13 - 16 May. Carol Seymour, who has applied to be the Focal Point for New Zealand managed the Australian October TTT process and this led to realization that both Australia and New Zealand have very similar cultural and community needs and opportunities for LVEP. To this end a joint venture has occurred between the two countries for the purposes of creating new LVEP for the whole community. A twelve week Home Study LV Course and a Community evening seminar series are being prepared and expected to be made available in both countries in early 2010. The objective is to bring the core Values to the public awareness and to encourage those inspired to consider the Facilitator role. Facilitators Anna Aranci and Raj Miles reported that a LVE Workshop was held on Saturday, 23rd May, Saturday and Sunday, 3Oth and 31st May at Paradise Kids Foundation complex on Gold Coast, Queensland, Australia. This workshop was extremely successful in that all participants came to the awareness of the Values in themselves that were easily attained and recognized those that were hidden or appeared to be less prominent in their day to day lives. All components were met with full enthusiasm by participants several of whom were already working in the field of therapy and personal development. All indicated a desire to continue the workshops leading up to Train the Trainer. Raj found an overwhelming sense of love throughout the experience, opening doorways within him. He feels the Living Values Education to be like points of light that on connection to those inside illuminate a pathway clearing and cleansing. Anna noticed a palpable difference in the participants from the first Saturday to the second with the week in between having provided time for embodiment and awareness. Core values had been well established for their immersing into how to create a Values based atmosphere. Both facilitators discovered a depth of vulnerability offered by participants which opened for a deeper level of healing to be available than the facilitators expected on the following two days. In herself Anna noticed a great ease and joy with no hesitation or anxiety arising at the prospect of facilitating the Program, quite different from other activities and workshops she has facilitated in the past. "We both noticed how beautiful and effortless it was to allow the structure of Living Values Education to cradle us all – facilitators and participants as we explored, rested, played and enquired into the Living Values program." 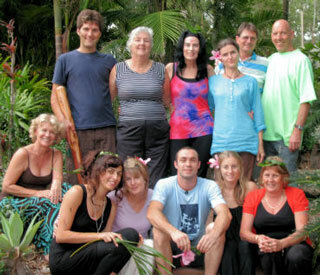 The Way of the Heart organization invited Indonesia's Taka Gani, an experienced LVE Trainer and a leader with Living Values Education in her country, to lead a three-day Living Values Education Workshop in Bryon Bay, Australia on 5 – 7 January 2009. As Taka said "LVE in Byron Bay was magnificent. Tears of love and laughter were our company throughout the workshop." Everyone was most grateful for the seminar and for the energy which surrounded the activities. Sixteen participants shared a wonderful experience. The age of participants ranged from 16 to 68. As the life experience of the participants and the professional backgrounds varied immensely, it became more like a retreat. At the end of the three days, a core group of eight persons expressed a willingness to carry on with Living Values Education as trainers. They will meet in February to reconvene and share everyone's personal "fallout" from the experience. 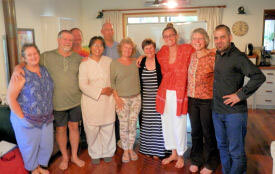 A further Living Values Education three-day course with the team of eight, plus new invitees – is planned for April 2009. This will provide opportunities for the core group members to gain personal experience co-facilitating the workshop. Since it commenced in Australia in September 1999, Living Values: An Educational Program (LVEP) has been implemented in four states: New South Wales, Victoria, South Australia and Queensland. Approximately 120 teachers and educators have attended six training sessions held since July 2001. Many of these teachers have implemented parts of the LVEP informally and formally into their classroom. A national retreat bringing together those teachers who have done the training and are using LVEP in their schools was held in October 2002 in Frankston, Victoria. Formed to further the development of LVEP in Australia, the Living Values Education Association of Australia (LVEAA) had their first meeting in June 2003. The Board Members of LVEAA include: Stephen Berkeley, LVEP Coordinator for Australia and LVEP Trainer; Joy Deleo, Director of the Office of Multicultural Affairs for South Australia and APNIEVE representative (the Asia-Pacific Network of International Education and Values Education); Proffessor Terrence Lovat, Dean of Faculty of Education and Arts for the University of Newcastle; Paulo Totaro, member of the New South Wales Department of Education and Training (NSWDET), Board of Vocational Education and Training and the Vocational Training and Accreditation Board. The University of Newcastle has conducted a research project involving nine schools in NSW and Victoria to evaluate LVEP. It involved testing student attitudes prior to implementation of LVEP and after using LVEP for two school terms. Results of this study are forthcoming. The Commonwealth Department of Education Training and Science commissioned 71 research projects on values education. Two of these were on LVEP. One was Maree Williams at Glendale East Primary School in NSW who has been suing the program since 1999 and Jacqueline Stein from a Private Secondary College in Melbourne. The final report was released in August 2003 and an executive summary of the report and full report are available (please see above). Since July 2002, there have been three parent retreats, one of which was for parents and children. The first Parent LVEP training was held in June 2002 in the Blue Mountains. The program led parents on an exploration of their own values and introduced skills to create a values-based environment in the home. There have been five teacher training retreats since July 2002. One of these was for an entire school, including parents, the school nurse, social and youth workers. Currently, we participated in a joint submission with a Montessori School for a grant under the Commonwealth Harmony and Unity Grants. This submission is still in process. Living Values: An Educational Program has been implemented fully in four schools in the States of New South Wales, Victoria and South Australia. Some 120 teachers and educators have attended 6 training sessions held since July 2001. Many of these teachers have implemented parts of the LVEP informally and formally into their classroom. A national retreat bringing together those teachers who have done the training and are using LVEP in their schools will be held in October 2002 in Frankston Victoria. The University of Newcastle is currently conducting a research project involving 9 schools in NSW and Victoria to evaluate LVEP. It involves testing of student attitudes prior to implementation of LVEP and after using LVEP for two school terms. The final report will be written in December 2002. The first Parent LVEP training was held in June 2002 in the Blue Mountains. The program lead parents on an exploration of their own values and introduced skills to create a values- based environment in the home. The program was well received and the second weekend training program will be held in November 2002. The LVEP coordinating office is in Newcastle and continues to send newsletters and updates to LVEP trained teachers. LVEP commenced in Australia in September 1999. July 2001 saw a lot of LVEP training occurring with LVEP Trainer Ruth Liddle from South Korea visiting the country to conduct a number of training programmes and give presentations. Ruth's trip was sponsored by APNIEVE (the Asia-Pacific Network of International Education and Values Education) and its main event was the four-day training in Adelaide, South Australia, from 17th to 20th July for approximately 50 educators, 28 of whom came from Singapore. She also conducted a two day training at Leura, in the Blue Mountains near Sydney, from 2nd to 3rd July, with 16 educators attending from the Blacktown District. Presentations on LVEP were also made in Albury and Newcastle NSW. From the 29th to 31st March 2001, Adelaide was host to the "Values Expo". UNESCO/APNIEVE initiated the event, which was officially launched in conjunction with the "Forum for Values in a Multicultural Community in a Globalized World". The Forum was addressed by Dr Lourdes Quisumbing (President of APNIEVE and former Education Minister of the Philippines), Professor Mary Ann Bin Sallik, Dean of the College of Indigenous Education, and Mr Geoff Spring, CEO, Department for Education, Training and Employment and Deputy Chair, Australian National Commission for UNESCO. The Expo was packed with dozens of values-based organizations, schools and teachers, all sharing their wisdom and experience to assist in the development of a culture based on positive human values. Now in its second full year of implementation, teachers at Glendale East Primary School designed a two-year lesson plan which spreads the lessons over a two-year period, with Peace, Respect and Responsibility being covered each year and with no lesson being repeated in that two year period. The lesson plan is flexible and if teachers feel they need to cover a particular lesson outside the plan they can do so. Year One: The children enjoy the activities - they are so nice and positive; we have to continually work on the lessons of Respect. Year Two: The questioning aspects of the Programme are a real strength. The children are really responding and thinking well. Year Three and Four: Activity lessons are very good and take a great deal of time; the children really respond to the gentle music; some children say there are no times in their family that are peaceful - their lives are so busy. The children love to be able to reflect and be peaceful - of all the lessons, these are the most positive with the children. They have an excellent release and are able to express what is inside of them. The visualisations are great. The activities and skills are so peaceful; we use the peer mediation skill very often. Years five and six: I use the Programme on Mondays - that is the hardest day, after the weekend. The Programme helps the children to focus away from their busy lives; the Programme was very difficult at the beginning but has been easier to implement as the children start to move into a different mindset. The Programme should be used and built on year after year. It is like a spiral. The teachers said they wanted to build upon this year to keep working with the Programme but to sequence the units into a two-year cycle.